In case of very low liquid rate separation, two-barrel separator is commonly used to solve the problem. The basic schematic of two-barrel separator is shown in figure above. As we can see in the figure, the vessel has two separated section to contain the gas and liquid. The fluid will enter the separator from the upper barrel where the inlet diverter is installed. The free liquid which separated form the gas during sudden momentum change while it hit the inlet diverter will flow to the lower barrel through connection pipe. The gas will flow to the gravity settling section before it passes the mist extractor and leave the vessel. 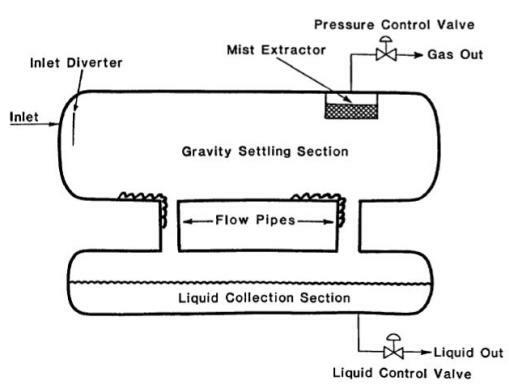 The droplet from gravity settling section will flow to the lower barrel through a flow pipe. The liquid collected in liquid collection section may entrain small amount of gas, the gas will be liberated to the upper barrel in this section. Because the liquid collection section is physically separated from gas stream so the high gas velocity will not re-entraining the liquid.